As electronic cigarettes, vaping devices and the overall vaping experience has grown more popular in recent years, this has resulted in a vast array of device options ranging from the fill and go starter kits, right through to custom mods used by more experienced vapers. Before we jump into what a vape mod is, we’ve broken down the three categories of vapers that we cater for here at Pure E-Liquids. A beginner vaper is someone who has just embarked on the journey of vaping and is likely to be just trying to give up smoking. You’ll be looking for a device which is easy to use, easy to maintain and of course, gives you an experience more aligned with smoking a cigarette. You’ll have little to no knowledge of vaping, or the items required for the best experience. For you, a starter kit would be more appropriate, such as our Vapour2 E-Liquid Starter Pack. This device is designed for ease of use, the entire top vape tank is replaceable, so you don’t have to change coils. You can charge it, fill it, and it’ll just work. Weighing just 18 grams, the Vapour2 is designed to feel like you’re holding an actual cigarette and the high-quality components provide device longevity not usually seen in such small devices. With an all-day battery life (depending on usage) and a tank which will last up to two weeks (or 15 refills), this device is perfect for you if you’re just beginning your journey into vaping. You are someone who understands the basic principles of vaping and how the overall process works. You are happy to carry out minimal device maintenance such as changing and priming coils. Alongside this you are happy to troubleshoot basic issues should they ever arise. Intermediate users typically still use devices which fall into the fill and go category, however they are more advanced than the beginner's starter kits. These devices have changeable coils which come in different resistances, but typically do not offer any variable wattage or temperature controls. These devices will be larger than the kits before them but come with benefits such as more power, more vapour and better battery life. 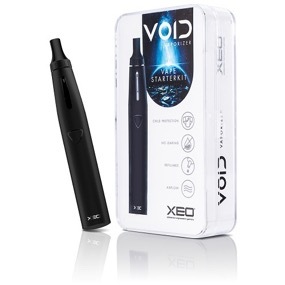 A considerable number of kits are available for intermediate users, such as the XEO Void Vaporizer. This kit features a more powerful battery and can produce more vapour and a better flavour experience than typical beginner kits. It features a refillable tank, a choice of different resistance atomizer heads, and can be used with both high PG and high VG liquids providing both standard and sub-ohm vaping experiences. You are someone who has a lot of experience in vaping and has used and worked to understand how more powerful devices such as mods work and the battery safety elements which need to be taken into account when using expert devices. You will understand what a mechanical mod is, how the advanced features of the device work including wattage changes and temperature control, and the types of atomizers required for your personal preference in vaping experience. Much like the intermediate kits, as vaping has become more popular, the number of advanced kits has grown substantially, and now they fall into two categories. Advanced kits, but relatively easy to use if you understand what we noted above. Alongside that, we advanced personal vaporizers or mods as they are more commonly known. These are devices where building your own coils isn’t uncommon, and a true understanding of the safety aspects of the device is needed to ensure they are safe to use. For advanced users, we have devices such as our Vapour2 Pro Series 7. This kit has an array of features including the ability to vape liquid, wax, and dry herbs, different wattage and temperature settings, cartridge recognition and auto temperature mode, magnetic controls and charging and thick flavourful clouds of vapour. A true all in one, providing the highest quality vaping experience for users that want more than just an e-cigarette.